The MOMocrats extend a warm welcome to our special guest contributor, Michelle Obama, the woman we hope will be the next First Lady of the United States. A few days ago, I headed to Tallahassee with Jill Biden, my friend and partner on the campaign trail. She and I visited Florida A&M University, where we met a crowd of thousands of people—some of whom traveled for hours to be there. Parents brought young children. Neighbors greeted each other in the sunshine. And students from FAMU, Florida State, and Tallahassee Community College waved signs and cheered with all their might for change. Jill and I went to Tallahassee to encourage people to get involved in this election. And this week, I’m off to Colorado, Missouri, and Michigan, where I’ll deliver the same message to everyone I meet. In particular, there is one simple thing that each of us can do to change the world: register to vote. But we’ve got to act fast. Voter registration deadlines are coming up in very soon in many states. So if you don’t register now, you may not be able to speak your mind later. A lot of people don’t know how easy it is to register. I wish I could sit down in every living room in the America, and walk every family through it! In most states, all you do is fill out a single form. That’s it. Registering to vote is a snap. But just because it’s easy doesn’t mean it’s unimportant. Just the opposite. Registering to vote is absolutely crucial. Because there is so much at stake in this election… and the choice we make on November 4th will decide so many issues that shape our lives and impact our families. Like whether we’ll get our economy back on track and restore the middle class—so that anyone willing to put in an honest day’s work can make a good living for their children. Whether we can afford check-ups for our kids and mammograms for ourselves. Whether we can pay for quality child care—so we can work outside the home and know that our children are safe. Whether our country finally embarks on a long-term energy plan that makes real investments in renewable energy, so we can create millions of new jobs, end our dependence on foreign oil and protect our planet for our kids and grandkids. And whether we will finally bring our troops home from Iraq responsibly, so we can rebuild our military and start investing the $10 billion we’re spending each month in Iraq right here at home instead. It’s never been more important that we all make our voices heard in this election. And that starts with registering to vote. During the past 19 months, I’ve met with women in towns and cities all across the country. And I keep hearing about how they’re so busy trying to do it all—balancing work, taking care of kids, looking after parents, and managing all their family’s affairs—that it can feel impossible to fit anything else on their To Do lists. But every day, when women drive to school or work or home, they almost certainly drive pass several places where you can register to vote. In many states, you can register at post offices, public libraries, and the DMV and other local and state government offices. And of course, you can register at any Obama For American campaign office. To make it even easier, we’ve set up a Website to help. It’s www.voteforchange.com. Go to that Website to find everything you need to know about how to register to vote… where to go on Election Day… and whether you can vote early in your state. So to all the women out there, reading this blog post… all the mothers, grandmothers, daughters, granddaughters, sisters, nieces, and friends who keep our country running every day… I urge you to take a few minutes—in between finishing that latest project at work, fixing dinner for your family, and paying the bills before bedtime—to visit www.voteforchange.com and register to vote. In 2004, more than 8 million women who were registered to vote stayed home on Election Day… and many millions more never registered at all. Because if there’s one thing I know for certain, it’s that women and families need an advocate in the White House now more than ever. So we can’t miss this opportunity to change the world and shape the future for our kids. If you agree, register to vote. And then, join me in heading to the polls on November 4th, to cast our votes… and bring the change we need to the country we love. Photo Credit: Stephanie Himel-Nelson, used with permission. P.S. Everyone, the last day for voter registration in Virginia is October 6th! I am VOTING (for Obama) and HOPING that we will be calling you First Lady.. And when I say hope, the only hope our country has is if Obama is our next President. Hi Michelle! Welcome to MOMocrats! I took part in a voter registration this past week for people without homes, we registered many first time voters and many, many Obama supporters! Not only am I honored to see you postin ghere with us, but this line, ". . . it’s that women and families need an advocate in the White House now more than ever." is so, so true. Thanks so much for this important message. Right now I am working to find out voting information for people in Bay Area Texas who have been displaced by Hurricane Ike. What an honor to have you visit Momocrats' site Mrs. Obama. You hit on one of the issues very important to me. There are so many, of course, but one that comes to the top each time is child care for families. As a working mom like you, trustworthy and effective childcare for my two year old is one of the most important decisions my husband and I make. We are lucky - far luckier than many families in that we have found a very good location to send our daughter. But you know the frustrating part? The unfortunate turnover at our child care center - just as it is all over the country. The people who are qualified and want to do the job of nurturing America's children at that pivotal preschool age just can't afford to work for what the centers can or do offer. Without health insurance and other decent benefits, the best and brightest tools for our kids' future are lost to better paying positions, far, far away from early childhood education. And it's not like working families can afford to pay more than we do for child care, so the cycle is ever constant. I can't tell you had happy I am to know that we'll have your experience and understanding of what working mothers go through so close to the next President of the United States. I think I speak for most Moms when I say that all we really want is the guarantee of good future for our children. We want a President who prioritizes that as well and we have found that in your husband. And as a bonus, I know we'll have our loudest advocate ever in you. As a working Mom and military spouse, it's so encouraging to me that somebody who gets our issues is running side by side with our candidate. Thank you for understanding what it's like. I am registered and fired up! If you're in NY, you still have time to register (October 10)! OK, I had to come back for a totally frivolous comment. I've taught my little boys how to do the fist bump (ages 2 & 4) and they now point out Mrs. Obama and "Barap" whenever we see your photos. Although, rest assured that I'll teach them how to say "President Obama" as soon as possible! Mrs. Obama - this is so cool! 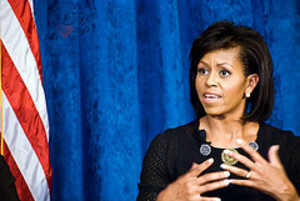 I signed onto one of my favorite sites to get some good Momocrats news and, geez, Michelle Obama drops by. I love this place! I agree that voting is important and we, as women, honor our feminist predecessors who fought so hard for us to be able to do so. As part of my little bit of "raising the next generation of blue" I take my little ones with me and also out canvassing and driving others to the polls. I am also a member of Blue Star Families for Obama and attended your roundtable here in Norfolk. Your platform supporting an active, engaged citizenry is very appealing to this Navy veteran and spouse. Voting is important, yes, but is only the first step in getting involved in one's community. I look forward to the day when patriotism is about serving others - through military service or any other community service which emphasizes benevolence - and not about whose got more yellow ribbons on their cars or has a bigger lapel pin. Thank you so much for being who you are and doing what you do! I think you are fabulous (and your husband is pretty cool too!). Thank you so much for posting with us today. We are thrilled to have you. Your message is so important to all Americans. Thanks again for your inspiring words. I keep thinking that I have so much to do, but then I stop and remind myself. So much of what I care about is at stake in this election. Whatever I can do to help Barack Obama win will enrich the next four years of my family's life. Off to sign up for phonebanking! Michelle, you are one hell of an admirable woman. I'm far from motherhood myself, but I appreciate your stances on women's and children's issues. With the McCain camp suddenly claiming feminism while still threatening to take our rights for equal pay and over our own bodies away, it's relieving to know that Barack has you by his side. Keep fighting the good fight, and show Palin what a real feminist, and most of all, a real woman is. I'm happy to see you writing here. I fervently hope that you will be the next First Lady of the US! I thrilled to see you here, posting with us Momocrats. In the midst of all the economic turmoil, it's easy to lose sight of the fact that November 4th is what it's all about. If you don't like what those in power are doing, the precarious situation they've left us in, it's time to vote them out. May the wind be always at your back (and blow you and your husband swiftly into the White House). Thank you for the inspiration you, and your husband, are to all of us. I cannot vote as I do not yet have citizenship - but I'm doing everything in my power to echo your message to everyone with whom I have contact. My husband is registered and ready to VOTE OBAMA in November! In this age of mass distraction, where talking about issues is almost unheard of. I do so appreciate a clear and strong voice. As a mother of 4 with the world against us all the time and trying to make life better for them and me and my neighbors, I feel the change. I am grateful for your grace, style intellect and common sense. You make me proud to be a woman and a Sista. Thank you for this post - I used to have a husband that complained about the government, complained about Democrats and politicians - my family shut him out. We said you can't be a part of this debate or discussion if you refuse to vote, so many others don't even have the option. The ironic thing is once he registered and started following politics he realized that he was at total odds with the Republican Party (not that there is anything wrong with that) and all that he thought they stood for. If he had not registered he would have stood on the sidelines and continued to complain (to me) about all that was wrong in the world instead of agreeing with me and my views (Democrat of course). I just wish everyone would follow his lead - voting is a privilege use it! Another mom here to say thank you for all that you are doing. Watching my three daughters and being a small business owner both drive home the message on a nearly hourly basis how important it is to send the Obama/Biden ticket to the Oval Office. You have two votes in our Adirondack household. Every time I hear one of your speeches, you turn me into a bowl of sniveling mush. Your message speaks to my heart, my hopes and my dreams for my children! I was disappointed that my citizenship application did not push through in time for me to help vote you and your husband into the White House, but rest assured that you have my husband's vote and we are both doing everything we can to spread your message of hope. Hi Michelle! I just came from an Obama volunteer meeting at my local office here in St. Louis County, Missouri. We're planning a huge voter registration event this Saturday, and we'll be running smaller voter registration events every day until the Missouri voter registration deadline, which is October 8th. We are working very hard to get people registered here in my hometown. I really appreciate your post. I believe voting is one of the most important things we do as citizens. So many people have forgotten that we, as Americans, OWN our government and are meant to have the power to hold it accountable. One of the best things about this nation is that we truly do, as a people, have the power to effect great change, and in a great democracy like ours it really only takes a little bit of courage, conviction, and common sense to use it. Thank you, Mrs. Obama, for taking the time to write of your experiences and your good work. I had the pleasure of shaking hands with your husband and Sen. Biden last week in Fredericksburg, and I can tell you that 26,000 people went away from that event -- despite the rain -- with a renewed sense of purpose and desire to do whatever we can to see you become First Lady. We must reclaim the White House in November; our families, our military and our communities depend on it. Reading your post on MOMocrats made me smile. Literally. Welcome to our little (but ever growing) corner of the blogging world. Your message is so important and inspirational; and you joining us here at MOMocrats just makes me feel-- yet again-- like you, Barack, and I really are in this together. Michelle, just tonight my mom called to tell me she was once again volunteering at the local Obama HQ in Florida. This is a woman who has never before been involved in an election. I credit your blogging at BlogHer, Momocrats, and women's voices on the web. Four years ago, I convinced my father-in-law to vote for the first time in his 60+ years of life. Now, he is so involved in following the elections and politics that it can be a tad bit annoying. Despite that, I am so proud of him and I can guarantee he will be voting Obama on November 4th. Now, who can I convince next? Many thanks to Mrs. Obama for her guest post, what an honor! Congrats, Momocrats! Love the get out the vote campaign! P.S. My mother, a lifetime Republican voter, is voting for Obama this year! When she told me I said, "this is the best day of my entire life!" I'm not a mom (though my wife is amazing one) but found this post via twitter.com. This is so awesome to see so many people pitching in to do everything they can during this election. I just fervently hope that this grassroots work and energized voting block can keep pushing for change and keep everything hopeful in every way we can. Michelle, I haven't had the pleasure of meeting you or your husband yet but my in laws have (they traveled to a few states just to hear Barack speak. You have very eloquently summed up things that make me sure that not only is Barack going to be the best President I've seen in my 33 years on the planet but you the best first lady since Jackie O.
Lastly: to Lawyermama, I too have taught my oldest son the fist bump. He's only 21 months but he loves the bump and also smiles anytime he sees Michelle or Barack on tv. Another fan of you and your husband here! Your surprise presence and crucial Get-Out-the-Vote message is a wonderful first birthday gift for our blog. MOMocrats has been around for a year this month. I wanted to thank you both from the bottom of my heart for your wise, unwavering insistence that the message this year is about the problems we face as a country, and that together we the people and our elected representatives can work for the things we need. You and Barack take the high road every time. Bless you for it. I've met Michelle Obama, albeit briefly. I've seen her speak in person, and via numerous recordings, and she strikes me as one of the most well-balanced, excellent, thoughtful people in the country. Welcome Michelle! Voter registration has been such a crucial part of the Obama campaign since it's inception. A brilliant strategy and perfect partner to Chairman Dean's 50 state strategy. The success could be seen the record turnouts for the primaries. I am confident that those efforts and the fact that Barack is such an excellent candidate with the ideas we need for this country, will mean that you will very shortly have the title of First Lady. Please keep being an inspiration to this wonderful country and those who serve. Michelle, you are an example of the best that our country can be. We're honored to have you here spreading the word about voter registration. Don't forget about us when you're all busy moving into the White House in three months. Thank you for the excellent message, and even better leadership. You are an exceptional role model for young girls, and all of us grown up girls, too. It would be too easy to go negative, but you and Barack are demonstrating that the high road is just as -- or even MORE -- effective. Thank you again! Thank you for posting here, Mrs. Obama. I look forward to your becoming our next First Lady. Thank you so much for taking the time to share your thoughts with us. Just today my 7 year old daughter asked me to 'vote for her' this year. I've discussed both Sen. McCain's and Sen. Obama's views on what would be best for the country in the next four years, and without a doubt she's decided that Sen. Obama would be the person to 'win the job' of President so that he can help kids get to see doctors when they are sick and have their parents be able to find jobs that pay well and maybe even make them happy. Her words, not mine. Raising girls is tough, you know that, and what happens this election will lay the groundwork for our daughter's early adulthood - and somehow they seem to know it. Thanks for being such a strong support system for your husband, and for the rest of the moms out there! I am looking forward to the day that Michelle Obama is announced as the First Lady. I have never been so passionate about an election as I am this one and I know I am not the only one who feels this way. Registering to vote IS easy. I registered long ago, but my addresses change so much that I must re-register every election. I went to my MVD and did it in one minute. It is that easy. Just make sure you print out the verification they give you, because if you are registering at this point in time, you may need that verification when you go to vote. We're so honored - okay, totally wowed, to have you guest post, especially, as Cyn said, during our one-year anniversary month. The voting effort *is* crucial, and your spelling it out so clearly is not only needed, but much appreciated. As an aside, just like Lawyer Mama, my son gets really amped up every time he hears your husband's name, and proceeds to tell me, yet again, of how he'll be our President soon. From his lips to the voters' ears. Thank you, sincerely, for everything you and Barack are doing to help lead us forward as a country. uh, that is, just like Lawyer Mama's *kids*. I wish to associate myself with the positive comments from all the folks here at Momocrats, several of whom I coulnt as real-life, personal friends. I am so happy to have you here with us. Sometimes being a blogger can feel like you're talking to people from a dark corner, some place where many can hear you but none can find you.It's pretty weird, actually. But...When someone like you comes on to blog with us, it brings everything to light. That is what I call cool... I will be pounding the pavement in Indiana Saturday, Oct. 4th. If I was only going to knock on 10 doors, your visit to MOMocrats has given me the shot of energy needed to knock on 20. Thanks for being wonderful! Michelle, welcome to our MOMocrats corner of the blogosphere! Just last night, I heard someone denigrating the effort of Democrats to 'register anyone with a heartbeat' as if every person, regardless of their perceived influence in this country, in this election, did not have an equal vote. I will proudly make sure all of my family and extended family are voting this year. I will be piling into the voting booth with my three little ones and casting a vote for hope, for change, for raising my voice against those who think that all Americans do not deserve an equal chance. Michelle, my husband has tried his best to resist you. This is based on his decades long rule that one must avoid getting caught up in the charms or not-so-charming aspects of a candidate's spouse. "I don't want to see the wives up there!" he'd holler at photo-ops of the candidates and their better halves, grouped together, posed and smiling on a podium somewhere on the campaign trail. The Hubs touchy feelings may have originated with his elementary school crush on Jacqueline Kennedy. Jackie's eventual marriage to Aristotle Onassis broke his heart and from that point on he bitterly ignored the graceful Lady Bird and turned his back on the tragic Patricia Nixon. Betty Ford was just a clinic to the Hubs and he had no lust in his heart for Roslyn Carter. Despite her efforts to get kids to "say no to drugs", the Hubs refused to see any redeeming qualities in Nancy Reagan. Though a dog fan, he couldn't care less about Barbara Bush and her spaniel Millie and he never liked Hillary Clinton. The Hubs is also a fan of libraries but even his everlasting love of the Dewey Decimal System couldn't endear him to Laura Bush, former librarian. "The candidates' wives don't matter!" he hollered at the TV when Cindy McCain made an appearance in an orange ensemble. "And, what the &#$! color is that woman wearing?" he had to add, sputtering and slamming his fist on the armchair. But with you, Michelle, he made an exception. You grabbed the heart of my rascally, bad tempered, Italian-American, Brooklyn-raised spouse and you didn't let go. You sealed it when he watched your speech at the convention. "I was prepared to not like her!" Hubs said as he wiped at a tear that ran down his cheek. "But, she's smart, honest, and strong!" Ha! Resistance is futile when it comes to you, Michelle! Then I told the Hubs of your many accomplishments and he asked if there's any way you can sit on his company's board of directors. I said, probably not, you being busy with this election thing and all. So, there you go. You won my cantakerous husband over. Not that he wasn't going to vote for your husband, my Hubs was electrified by Barack's convention speech in 2004 and was an early supporter of his in the primaries. The deal is this - he realizes now that the candidates' choice of life partners is a reflection of character. You complete the compelling story of Barack Obama for the Hubs and he honors your partnership with who he hopes will be the next President of the United States. To all this and much more I say - best wishes and well done, Michelle. I enjoyed the simple, straight-forward, honest message delivered by Ms. Obama, and hope the voters take it to heart - registering to vote is so important. And I read through all the uplifting, positive comments too. No doubt about it - both the Obamas have it right, and they'll be gracing the White House with their presence soon. It's too bad Canadians cannot vote in this election; Barack Obama is favored by 80% of Canadians ! It makes me incredibly proud that activist, blogging mamas I know started this site and keep it on fire with insightful, outrageous, intellectual, real political posts. It also makes me proud that it is a place that I not only love but where Michelle Obama stops by for a guest post. I am grateful for your contribution to this corner of the interwebs. I am also proudly wearing my Single Mamas for Obama t-shirt today since my preschooler's declared his intent to vote (that's how we do it here in Chicago) for "Oh-rock Oh-bama" too. Thank you Michelle Obama for joining us and becoming an Honorary MOMocrat! From the back of the Pepsi Center, I watched you speak for the first time and it was at that moment I knew you would be an excellent First Lady, carrying on the mission your husband has set for our nation. I can't imagine how difficult it must be to merge your career into his, but from my vantage point, you're doing an incredible job and your daughters are amazing. Please continue to set a fine example for all mothers and daughters in this country and to reassure us that we will receive equal pay for equal work. It's so important for the future of our children. More people are registering to vote and voting early each day. This is an exciting election. I hope the predictions that Barack Obama wins in a landslide become true. It's what our country needs and what it deserves. Best wishes to you. Thank you for this post! An important message, and it's just as important to see you out here in the blogosphere with us. This is awesome. On a personal note, my 4-year-old recognizes exactly two grownups on TV: your husband, and Jon Stewart. When we see a picture of Sen. Obama, he lights up in glee and says, "Obama!" Your family inspires hope in us. Dear Mrs. Obama - I was late getting to your post, but after scrolling through all the comments and reading how much you've inspired so many of us, I'm kind of glad I did. After the disastrous 2000 election, my UK-born husband couldn't stand watching from the sidelines any longer. His first act as a naturalized US citizen was to register, and he's voted in every municipal, state and Federal election ever since. For a long time this year, he had a hard time deciding who would get his vote... but the words you and your husband spoke at our nominating convention won him over. Thank you for giving so much and helping us have hope in America again. Our kids also light up when they see Barack and you on tv. Mommy! bwackubauma! I especially light up when I see you. As a someone who considers herself a proud feminist whose trying to balance family as the top priority following everythign else, I view you as someone who blends it all with such grace. I pray for Barack's victory and your families safety. Thanks for helping to rekindle the flames of hope in American's like myself! Isn't that Great, M.B. was here. As if she read all the followup comments. I wonder if she kept her job at the hospital? It was good to see she got that raise from $121,000 to $320,000++(approx.) as soon as Barrack made Senate. Funny how things like that happen, and that the hospital got a very large pork-barrel funding. Scratch my back I'll scratch yours Economics. No WONDER she is finally proud of America, getting a salary like that has to make a person happy. Shes going to need another raise to cover her tax increase after the hubby gets into office since she's over $250k. Ron, you can set up your haterade stand elsewhere.